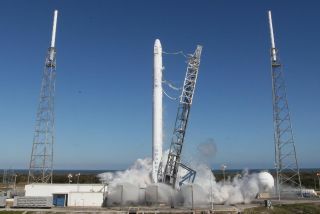 SpaceX fired up the nine-engine first stage of a Falcon 9 rocket Saturday in a major preflight rehearsal before the March 16 launch of nearly 5,000 pounds of experiments and supplies to the International Space Station. The brief ignition of the Falcon 9's nine Merlin 1D engines occurred with the rocket firmly fastened to SpaceX's Complex 40 launch pad at Cape Canaveral, Fla. The engines generate about 1.3 million pounds of thrust at sea level. A SpaceX spokesperson said the static fire was successful. Engineers typically spend several days reviewing data from such tests before clearing the rocket for liftoff. A launch readiness review is scheduled for next week to give the formal go-ahead for the countdown and launch of the Falcon 9 rocket with SpaceX's Dragon spaceship, an automated cargo craft to deliver and return supplies to and from the space station. Workers will also add sensitive experiment samples, fresh food and other perishables to the Dragon capsule's pressurized module. Most of the mission's nearly 5,000-pound payload has already been packed inside the spacecraft. Launch is scheduled for 4:41 a.m. EDT (0841 GMT) on March 16 from Cape Canaveral. Two days later, after a series of course-correction burns to adjust its orbit, the Dragon spacecraft will arrive in the vicinity of the space station, beginning a laser-guided final approach toward the complex. Astronauts Koichi Wakata and Richard Mastracchio will monitor the Dragon's rendezvous. Once the uncrewed spacecraft is at a hold position about 30 feet from the space station, Wakata will grapple the Dragon with the lab's 58-foot Canadian-built robotic arm. Capture of the Dragon spacecraft is expected at about 6:59 a.m. EDT (1059 GMT) on March 18. The Dragon spacecraft will be attached to the station's Harmony module with 16 remotely-driven bolts, then the crew will open hatches leading to the cargo carrier to begin removing the freighter's supplies. NASA's official mission patch for SpaceX's third Commercial Resupply Services mission to the International Space Station. The SpaceX-owned spaceship will also deliver a high-definition Earth observation camera package and a laser communications terminal inside its unpressurized trunk section. Ground controllers at NASA's Johnson Space Center in Houston will use the robot arm and the Dextre robotic handyman, fitted with two arms and tools for tasks requiring fine dexterity, to remove the payloads and transfer them to operating posts on the European Columbus laboratory module and an exposed platform on the station's truss. Departure of the Dragon spacecraft is set for April 17 after a one-month stay at the space station. The capsule will return to Earth with a parachute-assisted splashdown in the Pacific Ocean west of Baja California a few hours after its release from the space station, bringing back more than 3,500 pounds of experiment samples and other gear for analysis and refurbishment. The upcoming flight is SpaceX's third operational cargo delivery to the space station under a $1.6 billion commercial resupply contract with NASA. The agreement covers 12 missions through 2016. It is SpaceX's first flight to the station since March 2013. The March 16 launch is also the first flight of SpaceX's upgraded Falcon 9 launcher, known as the Falcon 9 v1.1, on a space station resupply flight. The Falcon 9 v1.1 launched three times from September to January with commercial satellites. The March 16 launch will also be the first flight with landing legs on the Falcon 9 first stage. SpaceX officials say they will attempt a controlled water landing of the first stage in the Atlantic Ocean northeast of Cape Canaveral following the launch. Track SpaceX's third official resupply mission to the International Space Station through Spaceflight Now's Mission Status Center.